We are showcasing each of the 12 contenders in the run-up to the Sports Personality of the Year award on 17 December. Today - Jonnie Peacock. Jonnie Peacock overcame serious cramp in the warm-up to take victory at the World Para-athletics Championships in London. Peacock, who is from Cambridgeshire, won the T44 100m final in 10.75 seconds for his second world title after success in Lyon four years earlier. The two-time Paralympic champion, who had his right leg amputated below the knee as a five-year-old after contracting meningitis, also became the first disabled contestant in the BBC's Strictly Come Dancing show. "He's a very talented, hard-working guy who's had his injuries but always manages to pull it together at the right time. "He has made a great name for himself. He is the poster boy. He has a great personality and has boosted the profile of Paralympic sport in general and shown what can be done." Peacock was fitted with a prosthetic leg and and kept active throughout his childhood, playing for the school football and rugby teams. 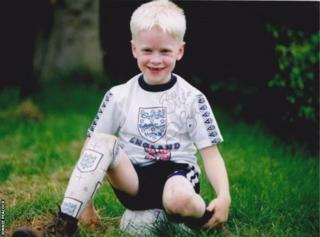 Aged 15 he attended a disability sport talent identification day and later joined up with a sprint coach. He made the final at his first major event, the 2011 IPC World Championship in Christchurch, before winning T44 100m gold a year later in front of home fans at the London Paralympics. Peacock won the world title in 2013, and defended his Olympic gold at the 2016 Rio Games. Dancing with partner Oti Mabuse, he was the eighth celebrity to be voted off this year's Strictly Come Dancing show. What he said: "I came here for the world title and I'm thankful that I finished the race in one piece." Stuart Patterson: If SPOTY really is about personality, then it is a foregone conclusion that @JonniePeacock should win it by a clear margin, not withstanding his sporting achievements (We'll maybe ignore the dancing part - kidding). Malgorzata Drewniok: So happy Jonnie Peacock is a contender this year. Amazing, inspirational athlete. Peter Williams: Is it okay that a Para-sports person has never won SPOTY despite some amazing performances? Jonnie Peacock has my vote. Sports Personality record: First nomination. No Paralympian has won the main award, although wheelchair racer Tanni Grey-Thompson was third in 2000. Nearly all sports have options or variations for disabled people and many clubs can accommodate people regardless of physical limitations. Visit the Get Inspired website to find out more about getting into disability sport. This article was originally published on 15 December, 2017.